To give something to Krishna is an extremely elevated activity – whether you give some of your time to hear and chant, some of your energy, some of your money or ultimately some of your love. If we give something to Krishna we do not loose anything. In whatever way you give something to him, he will reciprocate in manifold ways. If you can therefore give something to please the Lord, it is also for your own benefit. 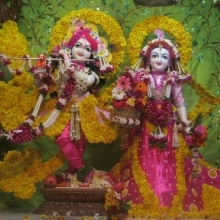 A devotee offers everything to Krishna – his words, his actions and his thoughts. This is, of course, an elevated platform, but Krishna declares in the Bhagavad-gita that if you cannot do this, then give at least a part of the fruits of your activities and you will gain upliftment to a spiritual platform. There are unlimited ways to contribute to Krishna’s temple – your time and service, financial support.